‘No Treaty, No Annexation’ are common buzz words from some arguing that the overthrow of the Hawaiian Constitutional Monarchy on January 17, 1893 was ineffective and the Hawaiian Kingdom still exists. However, where, specifically, does it say, then and now, that a ‘Treaty’ is required, or the Senate must vote on ‘Annexation’ in a certain way? Annexation of Hawai‘i to the US was not a hostile takeover, it was something the Republic of Hawai‘i sought. The Hawaiian resolution for ratification of the annexation treaty was unanimously adopted by the Senate of the Republic of Hawai‘i on September 9, 1897. Commenters, please focus on the question here: Where, specifically, does it say, then and now, that a ‘Treaty’ is required, or the Senate must vote on ‘Annexation’ in a certain way? 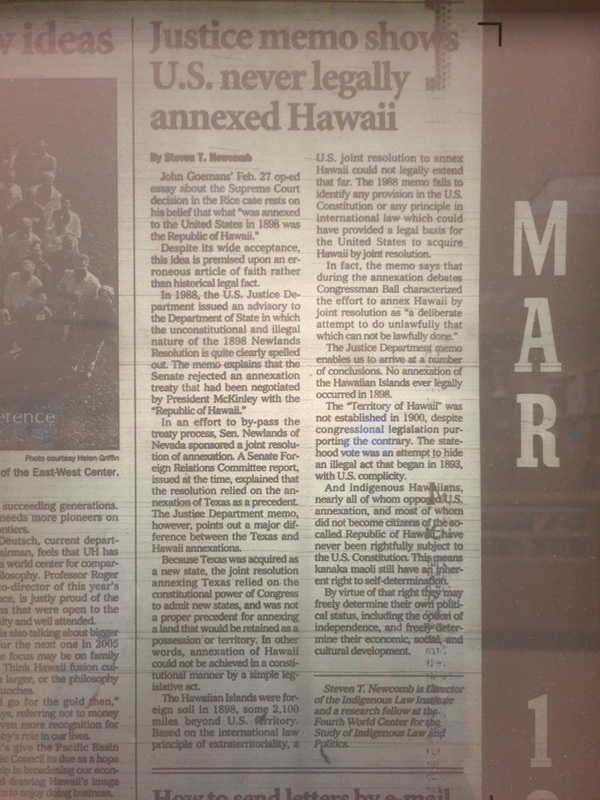 Some suggest that Hawai‘i was never annexed to the United States and, as proof, refer to the October 4, 1988 Office of Legal Counsel of the Department of Justice Opinion and a subsequent (March 12, 2000) Op-Ed by Steven Newcomb in the Advertiser to support their conclusion. Before we get far ahead of ourselves, we should first look at the noted Office of Legal Counsel Opinion and its purpose. While some would have you believe it was an opinion addressing Hawai‘i annexation, in fact, that Opinion was prepared to address “Legal Issues Raised by Proposed Presidential Proclamation To Extend the Territorial Sea”. The Opinion was not about Hawai‘i, nor its annexation – in fact, of the 26-pages of the Opinion (not counting appendices,) only 2-pages referenced the process of annexation of Hawai‘i. And Hawai‘i and its annexation to the US are not even mentioned in the Opinion’s Conclusion. Click Here to read the DOJ Opinion for yourself. Click Here to read Newcomb’s Op-Ed.